EmEditor Pro 18.7.1 Portable » SoftLab-Portable.com - Portable Soft! AutoFill and Flash Fill. EmEditor allows you to drag the bottom right corner of the selected cell border (AutoFill handle) to copy the same value as the selected cell to the up, down, right, or left neighboring cell(s). CSV, Filter Bar, and Sort. The new version enhances CSV features and adds the Filter toolbar. It’s a best tool to analyze big data and database files. The Snippets plug-in allows you to easily insert frequently used HTML tags (such as h1, h2, p, a, etc. ), templates, styles, scripts, and many other HTML elements. With the Snippets plug-in, you can use keyboard shortcuts such as CTRL + B to make the selected text highlighted (using the STRONG tag), CTRL + I as Italic (using the EM tag), etc. Zen-coding allows you to code HTML elements incredibly faster. The HTML Bar plug-in allows you to modify your HTML documents with familiar toolbar buttons. The Tooltip to show HTML/XML character references feature is useful. Matching tag highlight allows you to make sure HTML tag nesting is correct. The WebPreview plug-in allows you to preview HTML documents. External tools allow you to configure web browsers to preview HTML documents. External tools also allow you to set up external programs such as HTMLTidy to work with EmEditor. The CSE HTML Validator plug-in allows you to validate HTML documents. The Replace in Files feature allows you to replace matched strings with other strings. Moreover, you can easily convert encodings of multiple documents. The Projects plug-in shows the list of function and variable definitions in the current document or within a project. The Auto Marker feature allows you to highlight the same string as the function or variable names at the cursor. The Narrowing feature allows you to focus to a specified part of document and protect other parts of the document. Multiple selection editing allows you to change variable names easily. External tools allow you to set up your compiler with EmEditor. The spell checking feature understands CamelCase. Numbering allows you to insert sequential numbers. In conjunction with vertical selection editing, you can insert sequential numbers at the beginning or end of each line in the selection, which makes it easy to make an array of variable definitions. The Clipboard History allows you to insert previous text that you copied. The Find Matching Parenthesis/Bracket command allows you to jump between a pair of brackets. Scriptable macros allow you to create macros for your repeated tasks. You can also create plug-ins that fit your needs. EmEditor allows you to write text very fast. EmEditor can launch fast, and as soon as you open an EmEditor window, it allows you to start typing. The Snippets plug-in allows you to insert frequently used text. The Word Complete plug-in helps you to complete words while you type. The Outline features allow you to show the outline of your text. The Word Count plug-in can count not only words but any specified characters or words. The Status bar shows the basic information of the document such as the number of characters, words, and lines. The Messaging plug-in allows you to conveniently send a small part of your document to your peers. The configurable spelling feature allows you to check spelling of your documents. The Marker feature allows you to highlight any keywords in your documents, and the multiple selection editing feature allows you to conveniently replace a same word with another word. EmEditor allows you to open very large files quickly, and the Large File Controller allows you to open only a specified portion of a large file. EmEditor allows you to open CSV, TSV, or user-defined separator (DSV) files. You can sort according to column values (alphabetically or numerically), and you can configure sorting options such as stable-sort. EmEditor allows you to split or combine files. You can also use the bookmark features, so that you can bookmark lines that match certain criteria. Then you can delete those bookmarked lines, or extract bookmarked lines to a new file. The Delete Duplicate Lines command allows you to delete identical lines in a document. Server log files tend to be very large. 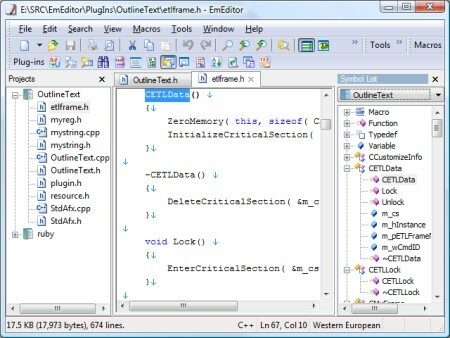 EmEditor can open very large files, and the Large File Controller allows you to open only a specified portion, for instance, the last portion of the file. The flexible search feature allows you to search for a specific term. You can also use the bookmark features, so that you can bookmark lines that match certain criteria, such as lines with error keywords or URLs. And then, you can extract those lines into a new file. The Marker feature allows you to highlight any specific terms, which allows you to read documents much easier. The Word Count plug-in allows you to count specific terms or characters.